Tree pruning is often referred to as trimming. 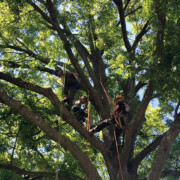 Tree pruning is performed by professionals to enhance the overall health and safety of the tree. Trees may be pruned to improve branch structure, to remove dead or broken branches in the canopy, to create clearance space around or above another object or to restore the tree where damage has occurred.